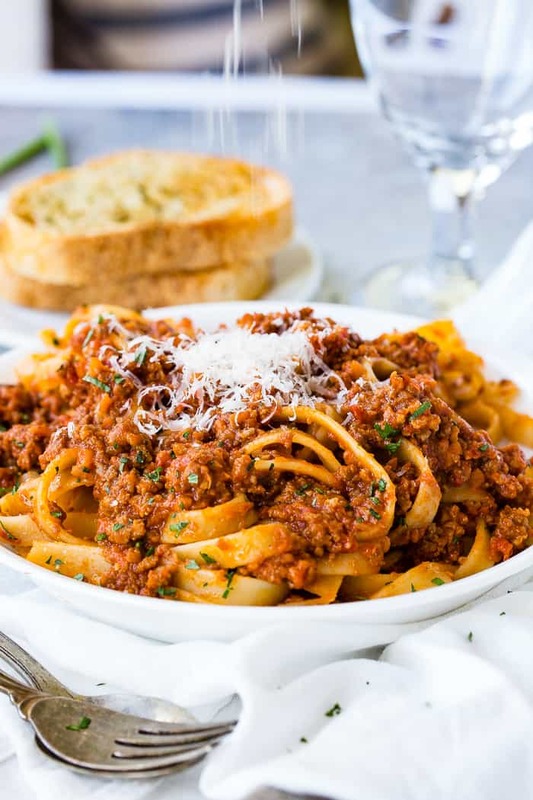 We should have posted The Secret to Authentic Italian Bolognese Sauce Recipe last year after we returned from Italy, but better late than never! We took a cooking class in Italy and I have to be honest with you, it was not our favorite. The food ended up really yummy, but the instruction was horrible. It was basically the chef flying through things himself, giving basic instruction, never letting the class join in until the very end for some quick pasta making, and at that point I was super over it. Until he taught us the secret to authentic Italian Bolognese Sauce and we got to try it. I wanted to bathe in it. Ok, he wasn’t but I’m telling you, it was wonderful. I can already read your mind, you’re wondering why we are so excited about spaghetti sauce, aren’t you? We actually aren’t, and I’m going to start at the very beginning, take you through the process and ingredients and then tell you the secret. And no, it’s not cheese. Ohhhhhh, thought you guessed it, didn’t you! What is the Difference Between Spaghetti Sauce and Bolognese? Is there a difference between spaghetti sauce and Bolognese sauce? They look the same. Smell the same, but think about it, do they taste the same? In order to really break it down we need to call spaghetti sauce by what it is more commonly known as, marinara sauce. Marinara sauce IS, at it’s simplest form, a tomato sauce, often with herbs and veggies like carrots and onion. 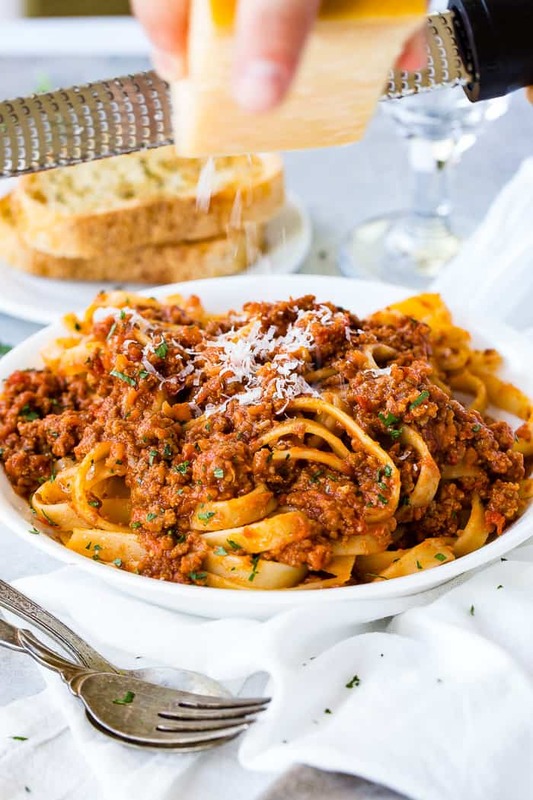 Bolognese is primarily a meat based sauce, originating in Bologna, Italy. Bolognese has just a bit of tomato for flavor, while the rest is meat and the other liquids are generally wine and milk. 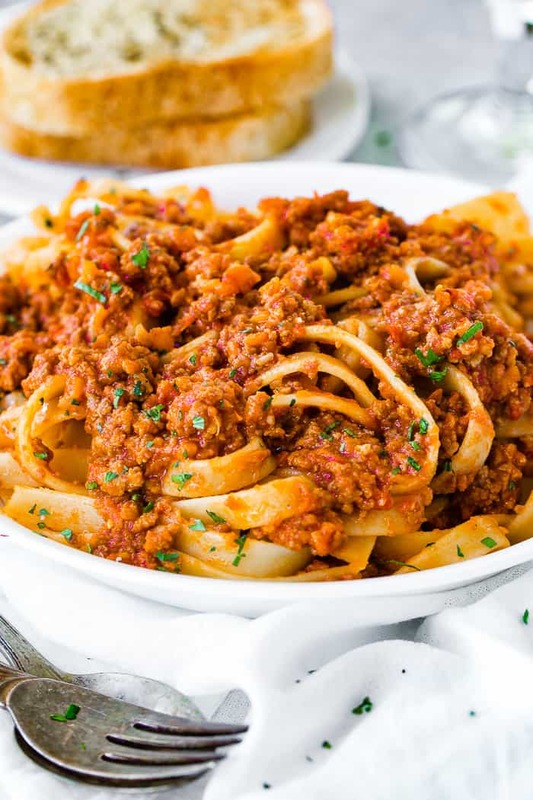 Bolognese is used on pasta or in lasagna. Ahhh now, you’re thinking about that meaty sauce, aren’t you? 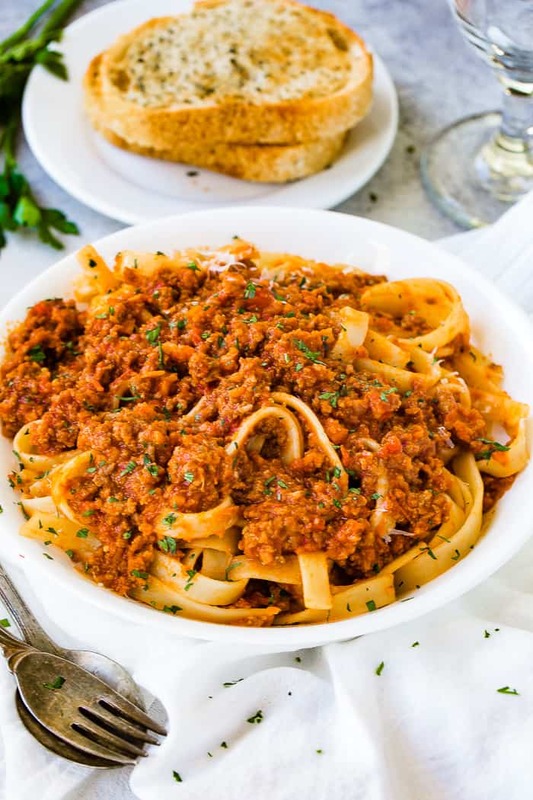 Can Bolognese Sauce be Made in Advance? Oh heck yes!! Not only can Bolognese be made in advance, it should be! Bolognese gets even better with time, so start that baby in the morning and simmer it all day long. Or make it the night before and store in the fridge, then reheat the next night for maximum flavor! Bolognese sauce can be made ahead and kept refrigerated in an air-tight container for up to 3 days. 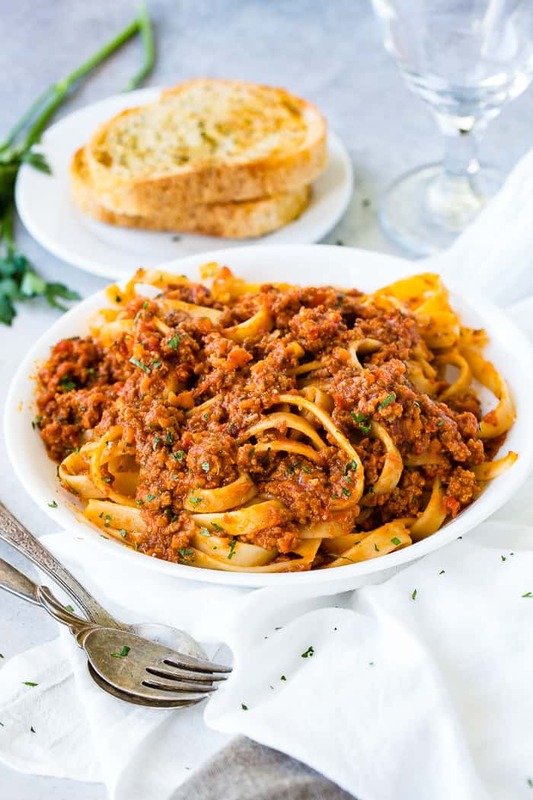 What Kind of Meat do You Use in Bolognese Sauce? Traditionally, Bolognese Sauce is made with minced beef or pork. 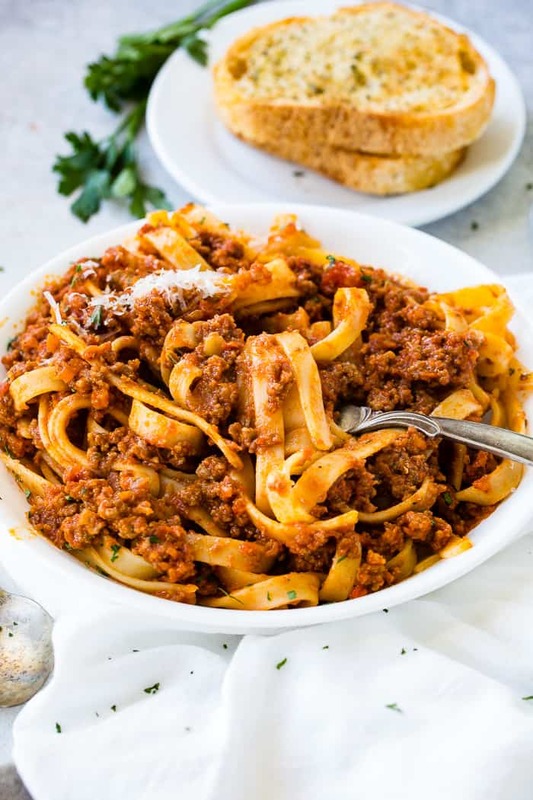 We really like the combination of beef and sausage as it’s a little more tricky to find all of the ground meats and make your own mixture like they did in Italy. Are Ragu and Bolognese the Same Thing? The real answer is that they are different, but to be honest, other than that one usually has a little less tomatoes and white versus red wine I really don’t think they are all that different. We don’t drink alcohol so it usually gets skipped in our recipes or a cooking wine is used, as in alochol free cooking wine. Sounds like we’d better go back to Italy and do some more investigating. This really shouldn’t be such a big deal but it kind of is. The type of pasta you buy should match the sauce and recipe you’re making. For example, can you imagine eating macaroni and cheese with spaghetti noodles? Or Alfredo with macaroni noodles? It just feels wrong doesn’t it? When you get into the red sauces it seems like you can really mix up the pasta shapes, and that’s true, but really pasta recipes are best when you use a certain shape. It helps to catch the sauce in the right way and the flavor and texture should work together and not against each other. Have you ever had penne with a really delicate sauce and felt like all you could taste was that hardy noodle? Point proven. These are our favorite pasta shapes for Ragu sauces, try to read each one without saying it in your best Italian accent on each one, I triple dog dare you. Papperdelle pasta is a wider, flat egg noodle that is perfect for bolognese. This is actually what we ate it with, but in picture I had to switch to fettuccini as we were all out. It’s a light noodle, but has plenty of surface area for the heart meat sauce to sit on. Fettuccini is a more common pasta shape than pappardelle, but they are practically the same thing. The fettuccini noodle is just slightly smaller, but still has better surface area for the sauce than a spaghetti noodle. Fettuccini is a Roman or Tuscan style of pasta that is also easy to make on your own pasta machine as that’s usually the size of pasta maker you receive. Rigatoni is often mistaken as Penne, but they are not created equal. In fact, we’ve listed the pasta shapes in order that we like to eat them with a ragu or bolognese sauce. Rigatoni are a tube-shaped pasta. They are larger than penne and ziti, and sometimes are a little curved. Rigatoni usually have ridges down their length, sometimes spiraling around the tube. Spaghetti isn’t usually a go-to for Bolognese as the meat just falls off of the noodles, but in a pinch, that’s the one we would choose. It’s a thin, long noodle, though not as thin as angel hair pasta. Penne is our least favorite. I find the texture too thick and heavy and the noodle isn’t wide enough to really capture the sauce. However, I must mention that it’s a typical shape that people enjoy for Ragu sauces so don’t skip it just because of us. Alright, we try to always answer the “can you freeze it” questions in these posts as we know a lot of you work hard on freezer meals. So what’s the answer? I adore freezing red sauces, while I never freeze a cream sauce. Red sauces only get better with time while a white sauce will separate and gain too much water. The trick is always the same, please, please invest in a Food Saver. You will thank me all the days of your life. It’s worth it. The end. What’s the Secret to Authentic Italian Bolognese Sauce? You’ve made it. This is the moment you’ve all been waiting for, what’s the secret to authentic Italian Bolognese Sauce? We use the zest and just a squeeze of the juice. I know, you’re shocked, but it’s true. Try it and never look back. And no, you’re not going to taste the lemon at all. Actually, there’s one more tip, use a red, not a white onion. It makes a difference, I promise. You’ll also notice that other than the chopped parsley as garnish, and the bay leaves there aren’t herbs at all. Trust us, this is a meat sauce, not a marinara and you don’t need them. A simple meat chopper– only a few dollars and soooo worth it! Le Creuset Dutch Oven– More than a few dollars but worth the investment for durability and how your food cooks and tastes. Trust us. Put it on your Christmas list. Looking for more Italian Sauce recipes? Who doesn’t love Italian sauces!? Make sure you try these out the next time you are making that Italian dish. Spaghetti Sauce, Pizza Sauce, and pesto. Here are a couple of another yummy saucy pasta dish that our family loves! Goulash time! Baked Mostaccioli baby!! 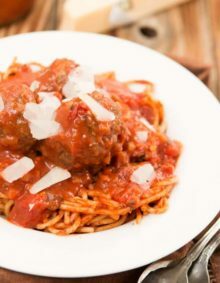 And don’t forget the Italian meatballs! Place 2 Cups of fresh tomatoes on a baking sheet and drizzle with oil and salt. Roast for 20 minutes or until soft and charred bits are appearing. Remove the tomatoes and set aside. Once cooled a little, blend the tomatoes in a blender to make a tomato sauce. In a Dutch Oven , over medium high heat, add the butter and oil. Once melted, add the carrots, celery, and onion. Saute, stirring occasionally until tender, about 5 minutes. Add the ground beef and sausage and use a meat chopper (it's only $6 and worth every penny) to ground up the meat as it's cooking. Once the meat is cooked, start adding all other ingredients. Stir to combine and simmer for 2-3 hours or up to an entire afternoon. This was amazing and the frozen leftover sauce was just as tasty when we heated it up a couple months later!! I followed your recipe exactly. So good!! Yessssss! Thanks for the feedback Sara! I made this yesterday for family Sunday dinner. My husband, who doesn’t care for pasta ate a huge plate! My home smelled delicious, like Sunday dinner should. So happy we have leftovers. Thank you for a bright & tasty sauce recipe. You just made my day!! 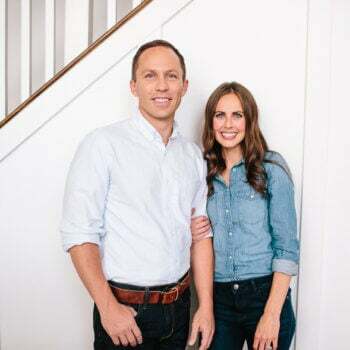 I’m so glad this was a success for you and your family! And it makes the best leftovers!! This looks amazing. Plan on making this for my daughter who just had my first grandson, It looks like Parsley is on it but I don’t see it in the receipt. Yes, the chopped fresh parsley is optional on top. Delicious! I added crushed red pepper because I always add it to everything for spiciness. I also threw in a rind of Parmesan. Thank you for a great recipe! Thanks, Lori! So glad you enjoyed it!! Do you simmer with the lid on or off? This. Is. Amazing. Thank you for posting. When we were in Italy last year (right when you made this post!! ), the Bolognese and rigatoni was one of our favorite dishes. This is superb. I could have eaten the whole pot all afternoon while it simmered away. Yay!!! Love to hear that Stephanie! Hope you enjoyed Italy! Thank you for the feedback! What are the calories in one cup of the bolognese sauce? What?! It looks like our nutrition calculator is malfunctioning again. I’m so sorry! Thank you for letting us know. I will look into it! Maybe you can skip the boring anecdotes and other stuff and just get to the recipe. I would have like to try this but lost it in the scrolling. That’s rude. She’s a blogger for a reason. Let people express themselves. Plus, if it’s that much work for you to scroll down through a post, you should find some bigger fish to fry. 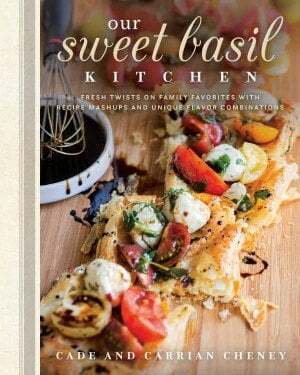 Maybe you should buy a recipe book instead of looking up recipes on food blogs. Stop being rude. Guess you’ll be missing out on an amazing recipe! I made this with 2 variations: I used half slow roasted shredded pork and half sausage along with the beef. I also did not have fresh tomatoes so used crushed tomatoes. Used chardonnay, not cooking wine. I just tasted it after 2 and a half hours and it is amazing. Such an easy recipe and SO good. Saving it for tomorrow so it gets even better! Thanks for the recipe! Yummmm!! Can I come over? 😉 Hope it was awesome! Hi it’s looks declines! I’m hoping you can help clarify with the tomato sauce. Do you use the raw tomatoes blended into a tomato sauce AND the 2 15 oz cans plus the fire roasted Tom can? That’s my only depart from Hazan’,s recipe. And the bay leaf. I don’t understand why it isn’t in her recipe, but in Bugialli’s. Thank you for your feedback Krista! I thought the secret was Grappa. You can’t make a good Bolognese without it. One of our favorites. This easy recipe turns out great every single time! Thanks Milisa! Those are my favorite kinds of recipes…reliable! I know they can be a lot, but they one of our main sources of income. I apologize for that! You scrolled far enough to leave a comment though, so you actually scrolled right past the recipe! I made this tonight and the whole family liked it! It’s definitely something I will make again. 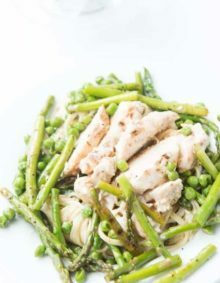 I used the lemon zest and just a quick squeeze for the lemon juice – couldn’t taste it at all. Hurray! So glad you and your family enjoyed it! I never buy cooking wine. It has salt in it and really just ruins it. The alcohol cooks out of the wine. 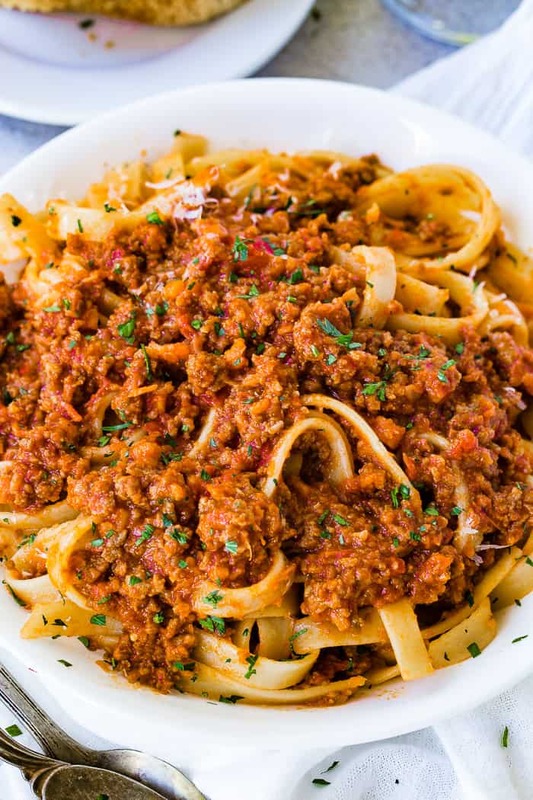 I’ve been searching for a great Bolognese recipe for about 10 years and finally found it. My family just finish this one and we loved it. I think it was a little garlic heavy with six clothes of garlic so I’ll try it with four cloves next time. I’ll also sweat the garlic before adding it to the mixture. I used marsala red cooking wine and it came out great. Even my two picky kids loved it. I roasted 5 roma tomatoes for that part of the recipe. Outstanding!!!! Yay! Love to hear it Steven! It has always been a crowd pleaser for us!! Hi I just made this a few hours ago. I keep tasting it and all I can taste is lemon. I didn’t think I am supposed to taste the lemon. I used the the exact amount of lemon juice but used a little less of the lemon zest from watching your video. It has been simmering for 6 hours. I just turned it off. Is there anything I could add to counter the lemon taste? I used pork and 85% beef. Salt counters the flavor of lemon so you shouldn’t be tasting the lemon at all if everything was measured properly. It is probably less salty because he used pork instead of sausage, which has more salt in it. Yessssss! You’re going to love it!! If the tomatoes are halved, is 2 cups approx 2 whole tomatoes? I did see that you buy romas… thank you! Romas are usually pretty small so I buy 4-5 to be safe! Thank you so much! I made this for a holiday party and it was a hit!!! Zero leftovers!!! So I’m making it again tonight!!!! Thanks again! Happy cooking!!! Thank you Korrie! Isn’t it so good?! And thank you for taking time to leave us a comment! Can you tell me at what point do you add the lemon? Step 10? Can you add the cream at the end ? I forgot to add with the other ingredients …. Of course! It won’t be exactly the same, but it will turn out great and be delicious! My family is from Bologna and I live very close to the city. If you ask any Italian in Bologna for spaghetti (pasta) Bolognese, they laugh at you. There is no such thing as (pasta) Bolognese. It is (pasta) in Ragù. REAL Ragù in Bologna is not made with beef, usually not made with sausage and is not red. The restaurants serve it the way you describe it because that is what the tourits are used to seeing (even those in cooking classes) and beef is much cheaper than pork and veal which is what the true recipe should contain. If you read the Bolognese dialect, I have a very good traditional recipe for (your choice of pasta) in Ragù. Try a little real Italian food. Your taste buds will thank you. Will you come make it for us? It sounds amazing! Ohsweet basil- I’d never seen such a Bolognese recipe before. Will give it a go today. Thanks! We would love to hear how it went, Tom! Well said Mandrioli, very well said! Ragu is gorgeously delicious BECAUSE of its amazing ingredients without making it too heavy. My grandmother used to say that when a dish is packed with spices when using meat, means you’re trying to hide something! Good quality ingredients don’t really need that many herbs and spices! MANDRIOLI – PLEASE…. can you send me/.us the recipe???!!!! 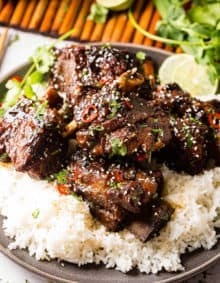 Could we make this in a slow cooker? Sauteing the veggies in a pan first. Yes! And just as delicious! Thank you so much Amy! Thanks for your support! Tomato sauce = canned tomatoes? Ketchup? Fire roasted tomatoes – This is in addition to the earlier 2 cups of roasted tomatoes? Hi Char! The tomato sauce is actual tomato sauce that is right by the tomato paste at the grocery store. The can of fire roasted tomatoes is in addition to the tomatoes you roast yourself and they can be found by the diced tomatoes. The can will actually say “fire roasted” on it. I hope that makes sense! Let me know if you need anything else clarified! I just scrolled through a standard bolognese recipe where someone took one of the ingredients and called it a secret. Clickbait much? I really liked your recipe, but also questioned the use of cooking wine, but it’s so generic and full of salt. Then when I read your response to a comment about this, saying you really didn’t know much about wine, it made me a skeptic. The right wine is essential in a lot of recipes. Cooking wine just falls short in so many ways. Before posting another recipe, you should be able to know red or white, sweet or dry. I hope you can brush up on wine for cooking before you post another recipe. I’m not trying to be snotty, but wine is a basic ingredient in Italian and French cooking. Yes, you can substitute for both of them. You could try unsweetened almond milk in place of the cream if you want. Thanks for the heads up on the butter. I need to remove the second one! Do you take peel and seeds off before or after roasting tomatoes? Surprised authentic recipe in Italy uses cooking wine…..to me that would be a huge difference compared to a good white wine. Even though you mentioned you don’t drink…..it would be better to print as a semi dry white wine unless they used a fruitier. Can you clarify the wine please. It makes a huge difference in taste. Thank you. Hi Gisela! You can take the seeds out before roasting, but the skin is much easier to peel off after the roasting. We don’t know nearly enough about alcohol or wine to be able to offer any advice on that. This has been simmering all afternoon and the smell is amazing! I’ve taken a couple of samples to see if anymore salt or pepper is needed and OMG!!!! I cannot wait for dinner time!!!!!! Yessssss! How was it? It does make the house smell amazing all day!! I made the classic mistake of not reading the entire recipe before I went to the grocery store so I have no fresh tomatoes but I do have canned fire roasted tomatoes. Think that would work? Absolutely…it will just have a little different taste, but it will still be delicious! This looks great! What tomatoes did you use? Roma/plum, cherry, etc? Did you chop them or roast whole? Romas work great and we sliced them in half and roasted them. You’re totally right! Perfect for a cozy fall meal! Enjoy and we would love to hear what you think! You’re going to love it!! Seriously so dang good! We would love to hear what you think! Great post. Loved learning about the lemon. My secret is using my own home made pork stock (no wine) for the 3-4 hours of simmering. Just a half to one cup at a time at a super low (just bubbling) simmer. At about hour 3.5 it magically turns velvety and creamy – though I never use cream in as in your recipe. Oooooohhh…that sounds so delicious! I love when magic happens in the kitchen! I can’t wait to make this, sounds amazing. Do I use hot or sweet sausage?? I would hate to ruin this with the wrong one. Thank you. We just get the mild Italian sausage, but any sausage would be delicious depending what kind of flavor you want! Thank you! Also, what is the “2 cups of roasted tomatoes”? Is that in a can or am I really roasting whole tomatoes and cutting up to make 2 cups? Hi Rachael! Sorry for the confusion! It is 2 cups of tomatoes you roast yourself. I clarified the recipe in the directions. Thank you for helping us make that more clear!